By now you’ve probably seen or heard about a viral Facebook video that shows in the wake of Tuesday’s election. You might have heard about similar incidents being investigated in DeWitt Schools. 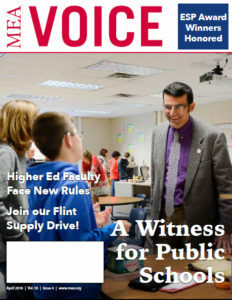 Changes are coming to education policy in Michigan, and several opportunities exist for MEA members and others to get involved. Members of the Grosse Ile transportation union used a $500 MEA/NEA grant to support local athletic boosters in a show of solidarity and community spirit. Now that the divisive campaign season is behind us, lawmakers should use the lame-duck legislative session to unite and address Flint’s suffering. It is past time to fix the water crisis that continues to damage the lives of Flint residents.